The Finance Committee consists of two parish trustees, one member from the Parish Pastoral Council, and volunteers selected by the pastor. The council's task is to prepare a yearly budget and discuss the financial and building needs of the parish, at the initiative of the pastor. Current Parish Finance Committee Members are: Father Marquard, Tom Dickson, Tim Keefe, Kevin Koopmeiners, Nancy Nelson, Paul Saffert, Jon Segner, and Mark Joerger. The Parish Pastoral Council is a body of parishioners who were selected based on their interest to serve the parish through a public discernment process. Their goal is to discuss and implement major parish pastoral programs and policies. As part of their overview of parish life, they also advise the pastor on various concerns in the parish at his initiative. This groups meets approximately 6 times a year. Current Parish Pastoral members are: Father Marquard, Laura Berscheit, Greg Dukinfield, Mike Feller, Maureen Fischer, Jennifer Harper, Robin Holicky, Jane Laurance, Paul Saffert, and Dan Vroman. Befrienders are parishioners who receive training and supervision to visit people in the parish who are living in their own homes, nursing homes or assisted care facilities. 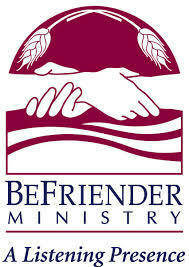 Befrienders offer spiritual and emotional help, a listening ear and take confidentiality very seriously. Most of all, they care. Occasionally people are in a recovery period because of surgery, illness or a recent loss. Some may need assistance with errands, a ride to church, a doctor, a communion visit, or just a little company during a lonely time. If you are experiencing a time of special need or know a parishioners who could use assistance of this kind, please call the Parish Office and let us know how a Befriender could help. Our Befriender Coordinator is Barb Helgager. Befrienders are also responsible for the religious care of Catholics in three care facilities: Texas Terrace and The Villa in St. Louis Park and Sunrise of Golden Valley. Volunteers from the parish bring patients to the rosary and communion services. The Knights of Columbus are a national, spiritually based Catholic men's organization. Their values are fraternity, charity, unity, and patriotism. They defend the unborn, support vocations, are religious, and have a special devotion to the Blessed Virgin Mary. Please contact Jeff Merry at 763-639-5271 if you are interested in joining the Knights of Columbus. Meetings are held the second Tuesday of every month at 7:00 p.m. in the Good Shepherd Social Hall. The Good Shepherd Prayer Chain is made up of people who are committed to praying for the needs of others as well as their own. The prayer chain is activated when a request for a prayer is given to the coordinator. These requests are recorded, and then a specific time is set aside for the Prayer Chain, the first person on the various telephone chain is called, who in turn calls the second, and so on. Each person carefully records the prayer request, quickly passes them to the next person, and then stops to pray. As of this update, the Prayer Chain has prayed over thirteen thousand requests, and many beautiful answers to these prayers have also been recorded. All calls are kept confidential. If you have a prayer request, or are interested in being a member of the Prayer Chain, please contact the Parish Office. Prayer Shawls are a physical sign of the caring and community of our parish in the prayers and care that to into the stitches of each one. Prayer shawls are available - - free of charge at the Parish Office. The Good Shepherd Prayer Shawl Ministry meets once a month in the Good Shepherd Social Hall, usually the first Monday of the month at 5:30 p.m. All levels of knitters/crocheters are welcome, beginners too! As Catholics, we respect the holiness of life from conception to natural death knowing that all life is precious. It is our moral responsibility to protect all life. The Good Shepherd Respect Life Committee sponsors a variety of activities and resources: donations to the Southwest Options for Women and Birthright of Minneapolis, Mother's Day Rose Sale, Father's Day Rootbeer Sale, Baby Bottle Campaign, Mass Intentions for the unborn and their mothers, and the pamphlet rack in the gathering space with brochures on topics relating to life issues. You are invited to proclaim the sacredness of life by joining this committee. The Respect Life Coordinators are Kathy Prenevost and Amanda Virnig. Please watch the bulletin for upcoming Respect Life sponsored events.